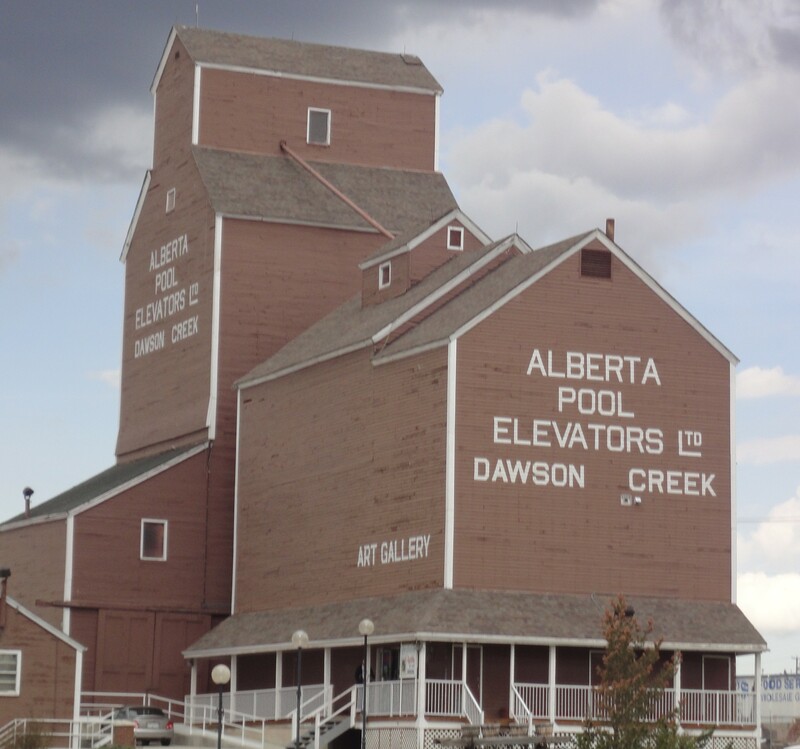 It is 450 kms from Fort Nelson to Dawson Creek, the beginning of the Alaska Highway. That 450 kms is jammed packed with … ummmm…. 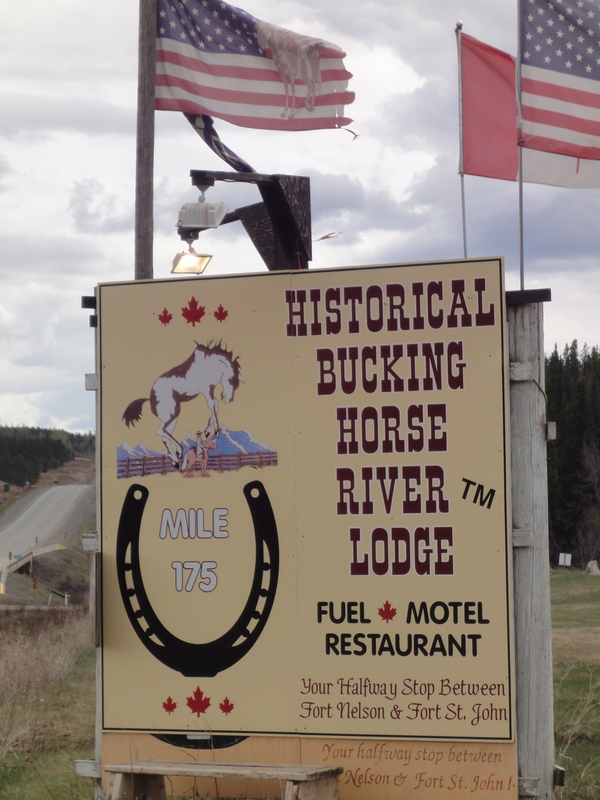 trees… mountains… and animals… and Buckinghorse River Lodge. Not quite enroute, is Toad River. (I should’ve brought it up on the last blog, but I wanted to talk about Loaded Joe’s from Dixie Lee’s instead! 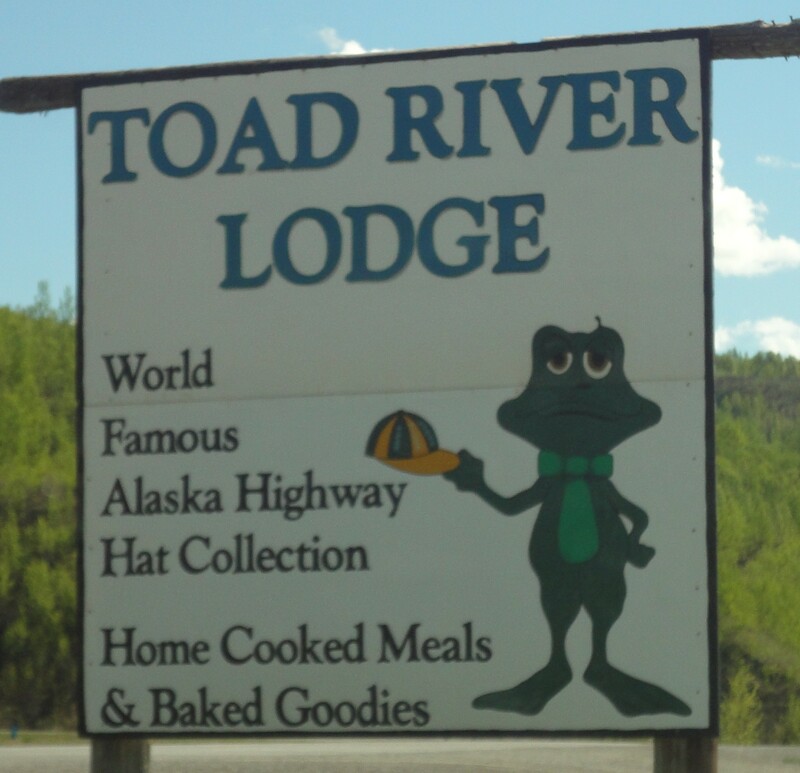 Toad River is actually 188 kms before Fort Nelson and 60 kms after Muncho Lake.) The Toad River Lodge‘s claim-to-fame is it’s World Famous hat collection, consisting of over 7,000 hats nailed to the ceiling. The Lodge has motel rooms, cabins, RV parking, laundry, and auto mechanic (really good idea, since you are way out there in the middle of nowhere!!) and a full service restaurant. We stayed over night at Fort St. John, and it was a typical town – I’m sure there’s tons to do there, but we were just passing through. 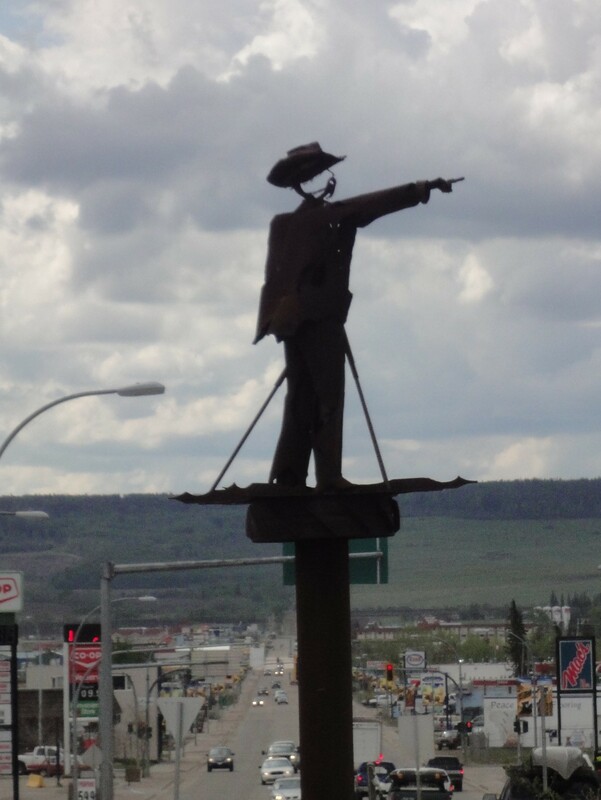 Passing through, on our way to Dawson Creek. The actual Creek was named for the leader of a surveyor team (George M. Dawson) who came through in 1879. By 1919, there were a few hotels and stores, and (thanks to the Railway coming through in 1931) around 500 people lived there by 1941. 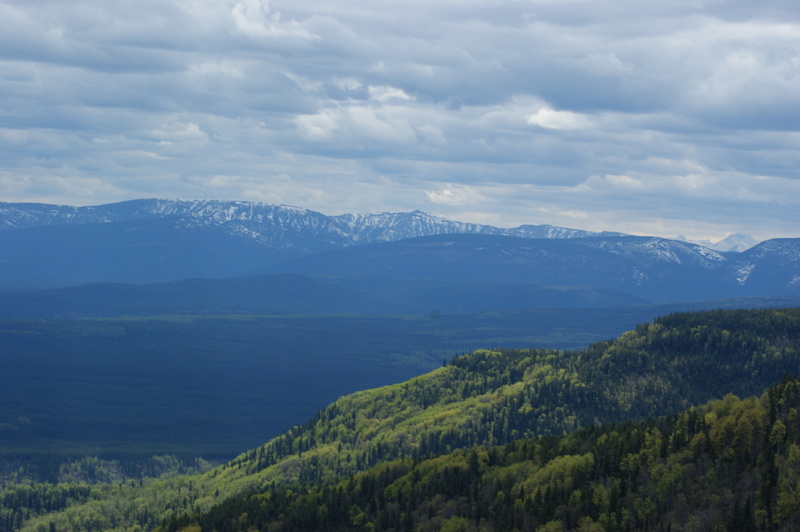 However, the main influx of people came after the completion of the Alaska Highway, and as of the 2011 Census, the population was around 12,000. You can visit the South Peace Historical Society Railway Station Museum at the original Northern Alberta Railway Station. 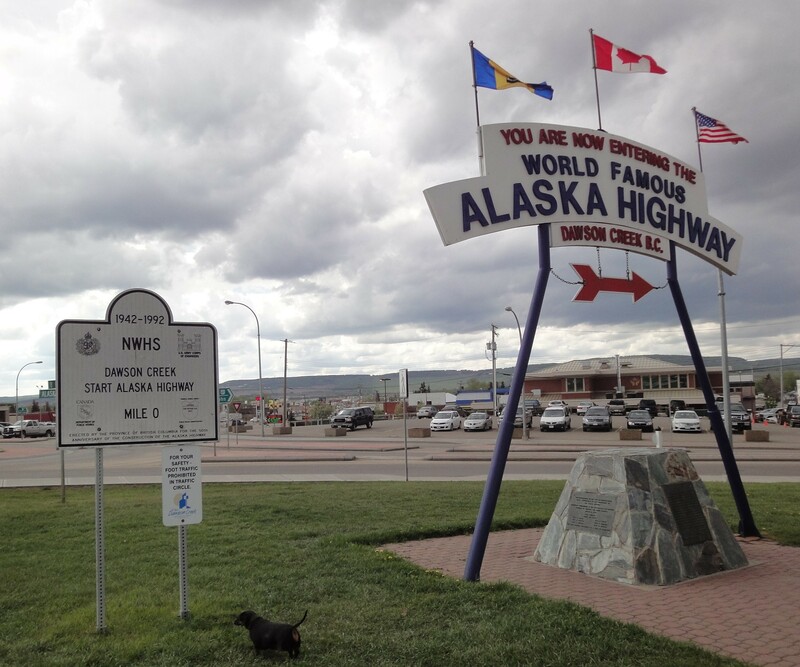 Dawson’s Claim-to-Fame is, as mentioned, that it is the start of the Alaska Highway, the Mile 0… On the “Biggest Ball of String” theme, this is a big deal and totally worth stopping for a picture. Our animal sightings for the day include: Black bear, caribou, dall sheep, deer, elk and moose. 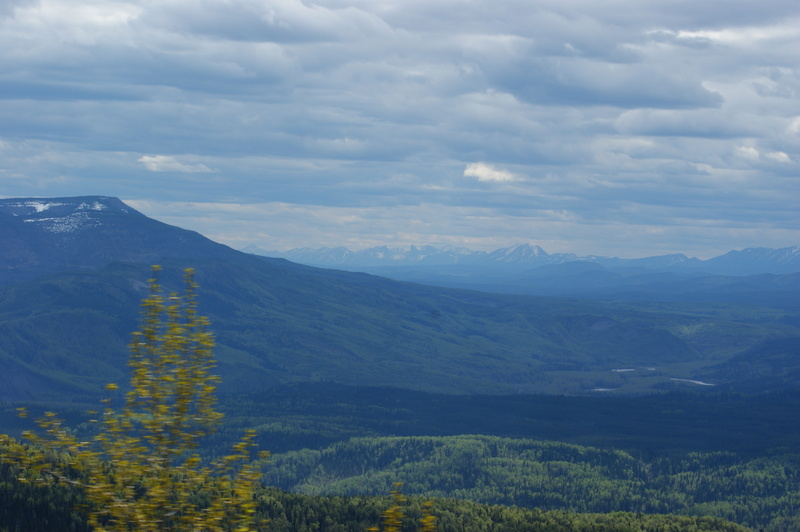 Next, we are on our way to Prince George, B.C.